HOUSTON (AP) Home runs kept flying over the wall at Minute Maid Park, on line drives up toward the train tracks, on fly balls that just dropped over the fence. Seven more were hit in Game 5, raising the total to a World Series record 22 – with two possible more games to play. 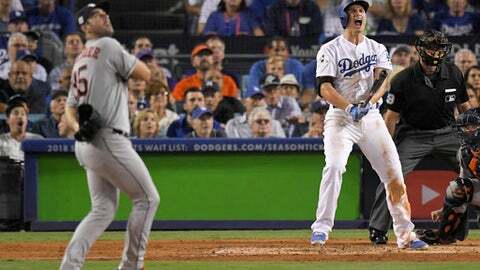 Twenty-five runs were scored in a game started by the Dodgers’ Clayton Kershaw and the Astros’ Dallas Keuchel, Cy Young Award winners regarded as among baseball’s best. After a season when sluggers outpaced even their steroid-era predecessors for home runs, some are convinced that something is amiss with the baseballs. A record eight home runs were hit in Game 2, including five in extra innings, and Game 5’s seven long balls would have tied the old mark. The 13-12, 10-inning Astros’ win Sunday night was the second-highest scoring game in Series history. Not so obvious to everyone, even amid the power surge. Same for Kershaw, even after giving up his record eighth homer of the postseason Sunday. This year’s long ball assault topped the 21 of the 2002 Series. Anaheim hit seven and Barry Bonds and his San Francisco Giants slugged 14 over seven games. That was the year before survey drug testing. Speculation that something has changed includes a study claiming to have found differences in the size and seam height of balls since the 2015 All-Star break. Baseball Commissioner Rob Manfred insists nothing nefarious is going on. ”I’m absolutely confident that the balls that we’re using are within our established specifications,” he said Friday. ”I know Mr. Manfred said the balls haven’t changed, but I think there’s enough information out there to say that’s not true,” he said. Verlander also does not think it’s an issue of how balls are rubbed up before games. Offense started rebounding during the second half of the season, and a record 6,105 home runs were hit this year, 2.4 percent more than the previous mark of 5,963 set in 2000 at the height of the Steroids Era. San Francisco’s Johnny Cueto and Toronto’s Marcus Stroman also think the balls have changed, with Stroman blaming slick balls for a rise in pitcher blisters – an affliction which has struck Hill a few times in the past couple seasons, too. Houston’s Brent Strom and the Dodgers’ Rick Honeycutt, the World Series pitching coaches, both were quoted by Sports Illustrated on Sunday as saying the slickness of the ball made throwing sliders difficult. Dodgers manager Dave Roberts had a similar view but acknowledged the power records got his attention.